The Canadian version of the Galaxy S7 for Bell Mobility - SM-G930W8 - has popped up in the Geekbench database carrying an octa-core Exynos 8890 chipset, allowing us to compare it directly with the Snapdragon 820-ladden model for AT&T, coded as SM-G930A. As you can see, the Exynos variant outscores the Snapdragon one in the multicore test and gives way in the single-core one, for identical core clock frequencies. This doesn't come as a big surprise, given other benchmark leaks of the two Galaxy S7 chipsets, and the difference has consistently been about 20% in favor of the Exynos 8 Octa chip by Samsung, yet it is nice to see two versions that are headed for the North American market being compared directly. The other info that can be gleaned from the benchmark tally is that the phones will ship with 4 GB of RAM, and Android 6.0.1 out of the box, as can be expected, and we are also providing a table with all known carrier models of the S7 for reference who is battling who in the benchmark table. In real-world usage, though, the two chipsets are likely to prove so powerful that these synthetic score differential probably wouldn't matter much in your day-to-day interaction with the Galaxy S7 or the S7 Edge, which is expected to sport the same silicon, what do you think? Not suprised. Exynos has always been the superior choice on Samsung phones since it's optimized well for it. Single core score is a bit low though..
Name me one app that will use only one core on Android. I'll wait. Why you have to steal my typical saying for this? I see you've been reading my posts. +1 for copying me! This is the Techie influence! Unless they've changed the text, I don't read that anywhere in the article. Frustrated to see single core performance of exynos, snapdragon will win the speed test. I would like to see the exynos and snapdragon variants go head to head in a speed test since exynos variant is low on single core scores, I feel the snapdragon variant may be faster when opening/loading apps. Opening and loading apps largely depend on hard drive speed and memory. Cpu speed is mostly useless since almost nothing uses it all in average use. GPU speed matters because it's in constant use and can easily be maxed especially in games. Better wait for the Gamebench examinations. Does anyone even proof read the articles here? 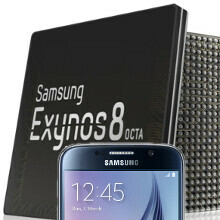 "the Exynos variant outscores the Snapdragon one in both single- and multicore tests". If you look at the picture the Exynos wins on multicore test but LOSES BIG TIME in the single core score. Anyway, let´s wait for the real benchmarks done by professionals, but my prediction is that they will have similar performance this time around. Why? Because this is what I expect the real performance will be:http://browser.primatelabs.com/geekbench3/compare/5117008?baseline=4968211 As you can see very similar for both. 4-core cpu is better... Single Core Score of 820 is very good! It will be battery friendly cpu of the year. 5000+ scores on multicore is not important so much. this is not IOS, multi matter very much on Android. never said you did :) but for performance on Android both single and multi is as important, I can agree with you on the battery part as I also belive that the SD820 will be more efficient than 8890 but we`ll see when the time and facts come won`t we. What phone you know uses all 8 cores. 4 low frequency cores for lite work, 4 larger higher frequency cores for heavy lifting. My Galaxy doesn't need the bigger cores, but I am sure its nice to have. Especially considering the price of a Xperia.